One Printable 8.5" x 11" digital collage sheet in both PDF and JPEG format. 300dpi resolution. Watermark will be removed. Sheet contains 18 blue and green butterflies. 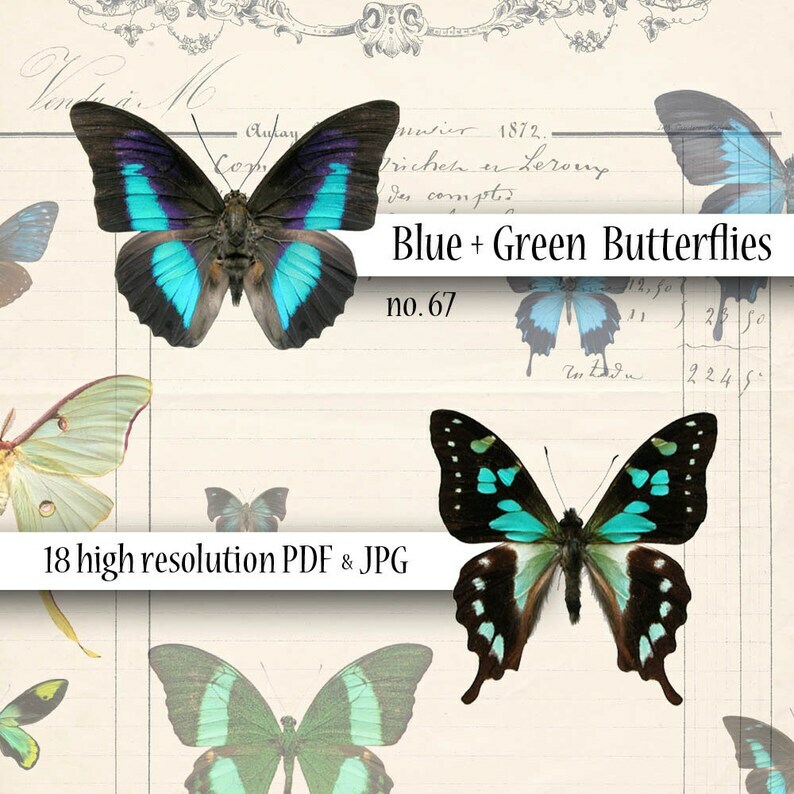 These are photographs of real butterflies that are digitally enhanced for color brightness. The largest butterfly measures 3.25" wide at the top of wings. The smallest butterfly measures 7/8" wide. Most average 1 5/8" wide. All images are sourced from ORIGINAL ephemera and then digitally enhanced for your creative use. We stock an extensive collection of antique papers, photos and ephemera, and we only work with images of the highest quality and resolution. These images are great for collage, mixed media, jewelry, and many other mediums. You may print these files at home as many times as you want. However, for best quality, we do recommend professional printing. Either way, we also recommend using 32lb. paper. This will give your image a more substantial weight to work with. You may use these images for your personal use or small run commercial use (i.e..handmade items sold on Etsy, craft fairs, etc..). You MAY NOT use these images to distribute or sell your own collage sheets or digital downloads. You will receive a link for downloading your purchase once payment is confirmed. We only accept Paypal at this time. Did not receive your link? You can download your files in the "Purchases" section of your Etsy account. Thank you for visiting our shop!! We LOVE vintage paper and hope to be your source for image inspiration. Great download. Images were wonderful. Payment is required at time of purchase via Paypal. Files will not be available until payment is received. Due to the nature of digital merchandise, refunds are not accepted. If you are unsatisfied with your purchase, please send us a message and we will work with you. Images are conveyed to you for your personal and light commercial use only. "Light Commercial Use" refers to small, limited edition, handcrafted items offered for sale at craft fairs, online craft sites (Etsy, etc.) or personal websites. Any other commercial use of these images without prior written permission from the Texas Makerie is strictly prohibited. Artwork created in whole or in part using our images may be submitted to magazines, online galleries, blogs, etc., for free viewing by your peers without restriction. Providing proper credit to www.etsy.com/shop/TexasMakerieDigital for our contributions to your artwork is appreciated, but not required. You are permitted to modify our images as needed to satisfy the requirements of your project(s), however these images will still be subject to the terms of this license, regardless of the extent of the modification(s). 1. Redistribute our images in any form or format, as-is or modified for profit or for free. No image purchased from or offered free of charge by www.etsy.com/shop/TexasMakerieDigital, may be re-distributed free of charge by the licensee or any of its assigns. 2. Claim intellectual or exclusive ownership of any of our images, in their original, modified and/or altered states. Translation: Altering one of our images does not make it yours! 3. Use our images individually or combined with each other or with another product or products, in their original state or modified, to produce other images and/or image collections intended for resale. 4. Distribute or sell our images in part or whole in printed or digital form. i.e…do not create your won collage sheets with our images. 5. Sell, trade and/or distribute these images free of charge in their original format or grouping. 6. Use our image(s) to create products that could be considered to be obscene, defamatory, immoral, unethical and/or for any purpose that would be prohibited by law. The spirit of our Personal Use License can be summed up with the following statement. "These images are for your personal use only and cannot be resold, redistributed or given away." Simply put, enjoy creating beautiful art with our images. Don't resell them or claim them as your own!